Ohanaeze Ndigbo Caretaker Committee, yesterday, told the President-elect, General Muhammadu Buhari, that President Jonathan lied to the Igbo nation about awarding contract for the construction of Second Niger bridge and major federal roads in the South East. Listing Enugu-Awka-Onitsha Expressway and Enugu-Umuahia-Aba Expressway, the committee said that up till now, work was yet to start at the sites. It added that no financial commitment had been made by the Federal Government to commence the construction of the Second Niger Bridge, saying that those were deceptive campaign messages to Ndigbo. The committee made the revelation during its congratulatory visit to Buhari at the Defence House in Abuja. The leader of the delegation, Chief Ralph, who spoke on behalf of the Committee, however, told the President-elect that the South-east was a silent supporter of his presidential ambition. He also stated that the region would fully support the incoming government to succeed, urging him to reconstruct Nigeria. Re-visitation of the report of Oputa Panel and the issue of abandoned property in the country were also other matters the committee presented before Buhari. He said: “This is a delegation of Ohanaeze Ndigbo Caretaker Committee, who proudly took side with you, convinced that what Nigeria needs today is the leadership that you will provide to rebuild our battered and pulverised nation. “The Ohanaeze Ndigbo Caretaker Committee is fully aware of the difficult and daunting work that has befallen on your shoulders. And we are here to offer our commitment that Ndigbo will stand shoulder to shoulder with you on this mission to reconstruct our nation. “We are also aware that our cry of marginalization is not unique to our region, but ours stands out as an SOS case as a region criminally neglected and abandoned by the outgoing administration. “During your campaign tours, you saw things for yourself and needless reminding Your Excellency that South-east is an emergency case. You drove through the badly neglected and impassable Enugu-Awka-Onitsha Expressway and the Enugu-Umuahia-Aba Expressway, needless to mention the Oba-Okigwe Highway. “Contrary to the election claims by the outgoing administration, no appreciable work is going on these roads, information has shown that no financial arrangement has been firmed up for the Second Nigeria Bridge. The Oputa Panel report has been gathering dust and Ndigbo have pleaded for the revisitation of the so-called abandoned property in Nigeria and its collateral reparation demand. “One common denominator is that unknown to a vast majority of Nigerians, Ndigbo were the silent majority supporters of General Muhammadu Buhari, GMB, but a twist of “what is wrong with Nigerian” electoral result cannot prove it. Obioha also made a case for the office of the Secretary to the Government of the Federation, SGF, to be ceded to the South-east. 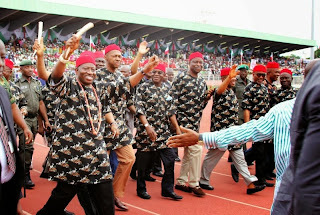 “This body, Ohanaeze Ndigbo Caretaker Committee, is a baby conceived by Chris Ngige and delivered by Chief Mbazulike Ameachi and handed over to Ndigbo to check excesses of the people who were just agents of a pre-determined agenda. “Your Excellency, you were aware that the South-east was targeted by the PDP rigging machine which produced an election result that denied the zone of even a single senator and only three non-ranking House of Representatives members. “Ndigbo request that you adopt the principle of necessity to give the zone the position of Secretary to the Government of the Federation which is your prerogative and in addition, a position of one Presiding Officer in the House of Representatives,” he stated. According to the leader, Buhari assured them of equity. Also speaking, a member of the delegation, Senator Chris Ngige said that though the party was yet to make a categorical statement on the issue of SGF, he was optimistic that it would eventually consider the South- east. “Well, I was in the first delegation that came the last time, but we cannot say for now that our party has zoned the position of SGF to the South-east because we have a Senate committee that is still working on distribution of party offices, executive and that of legislature which is where we have the Senate President, Deputy Senate President, Speaker, Deputy Speaker of the House of the Representative as presiding officers."